The past couple months have been incredibly challenging and rewarding for me. I was assigned the task of producing three large photo shoots for Italian clients Grana Padano cheese and San Daniele del Friuli prosciutto, a campaign my team has been eagerly awaiting for almost a year! The two consortiums, consisting of about 160 individual companies, were just awarded with the Protected Designation of Origin stamp in recognition of their regional tradition, taste and superior quality by the European Commission. In celebration of this honor, the two consortiums teamed up for a campaign in order to spread their names (and regional products) throughout the European markets. The challenging part was that, once contracts were signed and the campaign began, I had just two weeks to organize all three shoots – in Italy, speaking no Italian – in order to meet the clients' fast-approaching deadline. Two weeks to recommend, get client approval, negotiate rates and then hire the photo team, Neumann und Rodtmann, manage the budget, ensure arrangements for the stylist, assistant, translator and rentals were made, coordinate with the clients on locations and "real people" models each shoot, scout the locations (that's where the 800km of driving came into play), purchase props and gifts for the location owners, make travel arrangements for myself and my art director colleague, Sylvia, plus manage the clients' expectations. It was great fun, and very very intense. Everyone worked double time, and we were able to pull off all three shoots in 4 days, 800 km and a crew of 7. The photos came out great and the clients are satisfied. …and every step of the way, there was very delicious (and dangerous) Grana Padano cheese and San Daniele prosciutto for the nibbling! 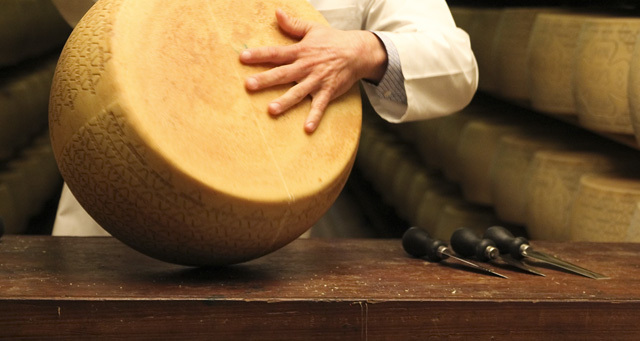 For the Grana Padano motive, we determined that the best location would be at one of their dairies, where the cheese wheels are aged for 9 months in long, beautiful warehouse rows. The best model was Roberto, a spokesman for Grana Padano and an expert in the tapping, branding and opening of the cheese wheels. He also looks like a sharply-dressed, Italian Bruce Willis. Not bad. For the San Daniele motive, the most photogenic location was in one of the storerooms, where the prosciutto legs are hung for curing. Women typically salt-cure the ham legs in this process, so the owner of the factory, Mrs. Coradazzi, and another female employee volunteered for modeling. They wore nice, white uniforms and were all smiles as they demonstrated the process for us during the shoot. The third motive called for a combination of the meat and cheese, so I asked the clients to recommend a traditional Italian deli for us. After scouting the locations myself, we chose a beautiful old deli not too far from the San Daniele headquarters. The owner of an enoteca across the street was our model; Bepi is an older gentleman with white hair, a great smile, wearing a tie under his apron. He is exactly who you would expect to be running a traditional deli. As for the shoot, the deli began as an empty canvas, and it took 4 hours of rearranging meat and cheese and assorted deli items until the location became a perfect 50/50 blend of San Daniele and Grana Padano. If the scene was too full of prosciutto, then the Grana Padano client requested more cheese. If there was too much cheese, the San Daniele client requested more prosciutto. But we finally got the scene perfect, and the photos look incredible. Here are some of my favorite images from the Grana Padano and San Daniele shoots. Enjoy!